been a whirlwind week for me. I’m currently back on the east coast visiting with family as well as taking some time early in the mornings to get out, explore and photograph landscapes that are very different from my usual Colorado haunts. Waterfalls, beaches and lots of green stuff to shoot here in New York which makes for a nice change of pace. I flew out to New York from Colorado just after 9:00 AM on Saturday. Before I left I had to get one more morning sunrise in Rocky Mountain National Park. I was limited to where I could go shoot because I would only have a short amount of time before I needed to hustle to Denver International Airport to make my flight. With sunrise at 5:30 AM I figured I would have just enough time to get somewhere for sunrise but of course hiking long distances was out of the question. I find it easy to overlook some of the areas of Rocky Mountain National Park that don’t require long hikes or huge efforts to access come summertime. It’s fun opening a map of the park and finding far away lakes to explore and photograph but sometimes this approach leads me to neglect some of my favorite, more easily accessible locations. Restrictions placed on your photography oftentimes can be the most beneficial. It can keep you focused and forced to work within your limitations. So with all that said, Lily Lake made for a perfect spot to spend a truncated morning in Rocky. Of course having an amazing sunrise made it all the more worthwhile and made the rush back down to the airport to catch my flight. 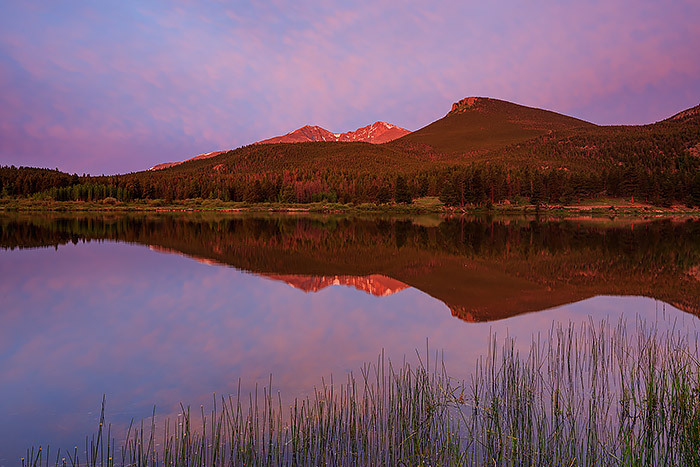 Posted in Colorado, Photography, Rocky Mountain National Park on June 25, 2014 by Tom Mangan. ← Previous: "The Folly Of Perfection"